Odd-Ball?!? Jog on. The Harrier is the most beautiful jet fighter ever built. Well done Great Britain. And well done dornbi. Beautiful model, mate. ^I wouldn’t have blogged it if it weren’t a beautifully built model, but I do think that Harriers are odd-looking, with their big intakes, fat fuselages, weird tandem undercarriage and drooped wings. They were effective and innovative, but if you think its the most beautiful jet fighter ever built, I want some of what you’re smoking! Although not as conventional as say a Tornado or an F-15, I’ve always found the Harrier particularly lovely , esp from the angle in the pic. Those big intakes and angled swept wings give it a look of ferocity, esp when said wings are loaded with ordinance. The tail section isn’t very pretty, though. As for most beautiful jet ever built, the Northrop YF-23 “Black Widow II” gets my vote. ^Peter made some great photographs and I agree that this is probably the most attractive angle. I do actually like the Harrier (I built one myself several years ago) and wouldn’t call it ugly, exactly, but I do think it is somewhat odd. I agree that the YF-23 was a looker (certainly for a stealth aircraft), but my pick would have to be either the Grumman F-14 Tomcat or the Sukhoi Su-27 Flanker. If you’re willing to look beyond fighters, the RA-5C Vigilante and SR-71 are definitely on the list. “Smoking”? Come on. That’s a bit of an out of term thing to say in regards to someone expressing a subjective opinion, isn’t it? The Harriers are gorgeous. The curved profile, the dome cockpit etc… they look like a dove on steroids. Stunning piece of aircraft design. They look tough and sturdy. The YF-23 looks like a poorly made paper plane and the Grumman F-14 Tomcat with it’s wings out looks like a bird that’s flown into a window. The SR-&1 is pretty. Odd but very pretty. I’m sorry that it isn’t clear to you that my comment was in jest, but I don’t think you’ve got much to complain about after you wrote ‘jog on’ in reply to my opinion. I don’t expect you to thank me for blogging a fantastic model of your favourite fighter of all time, but that wasn’t exactly polite, was it? Ralph, I didn’t even know you posted this. Didn’t notice your name on the bottom there. The F-14 and the Su-27 are both beautiful planes, as well as the F-18, F-16, and MiG-29. Anyway, good job on this, dornbi. I saw your Harrier a few years back Ralph..simply beautiful, as always. Thank you. 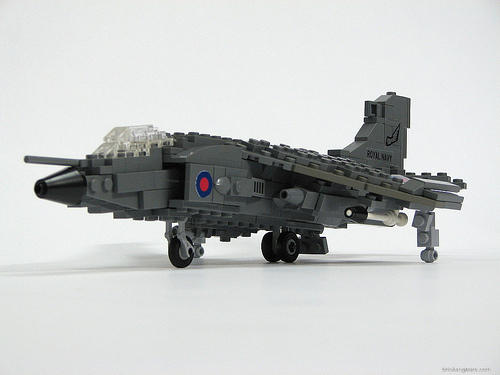 I enjoyed building my Harrier, but I also remember it being quite difficult, because it does have a shape that is quite unlike any other fighter. It’s part of the reason why I like Dorbi’s so much, because he’s managed to capture that shape very well in a model that is about 2/3 of the size of mine.